After washing or rinsing, residual moisture and air can cloud a fine crystal decanter, marring both the taste and color of your wine. Avert disaster by simply inserting this dryer. By morning, the crystals contained within the muslin sleeve will have absorbed every last drop. Re-use them again and again. Dry those unreachable areas. After washing or rinsing, residual moisture and air can cloud a fine crystal decanter, marring both the taste and color of your wine. Avert disaster by simply inserting this dryer. By morning, the crystals contained within the muslin sleeve will have absorbed every last drop. Re-use them again and again. Can these be micro waved after use to help dry them out? BEST ANSWER: You don't have to dry them out. They dry themselves as the decanter dries. BEST ANSWER: Of course, you can. 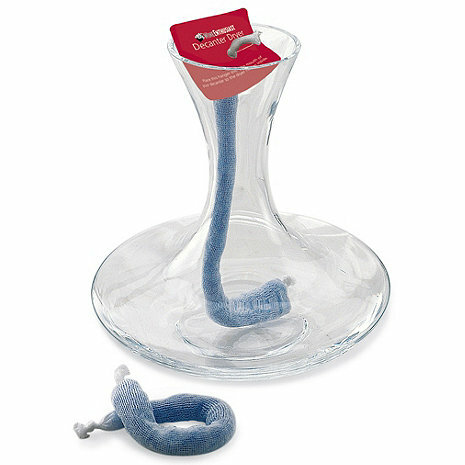 I would use the wine glass cleaner sold through this site and there are decanter cleaning beads. Let it soak for a while depending on how much mold there is. Swish it around with the beads. Then use a sieve or a colander with very small hole and empty the water and beads into whichever you chose. Under no circumstances would I use bleach to eradicate the mold. I'm very fussy when it comes to my wine glasses and decanters. no you can't wash it, in fact letting it sit in water is most likely the reason it's moldy. Get as much water as you can out of the decanter then hang the dryer and do do cover it. That's what I do and I had no problems and have continues to reuse my dryers for a very long time. Throwing it out is a waste of money. You can wash it. Just be patient to get the desired results. After you do, you just have to make sure it is dried well. Wine decanters don't have lids. Other liquor decanters do. This site also sells decanter drying stands and equipment to aid in this. I am not an employee or associated with this site except as a customer who is more than satisfied with their products. Also, I never use dishwashing liquid. I haven't encountered this problem. I think if faced with it I would just throw it away and get a new one since they aren't that expensive and I'm not sure how well it would respond to washing and drying. Yes, this can be washed. If you have experienced mold however, I'd consider purchasing a new one. I don't know if one can--call Wine Enthusiast, perhaps they'll know. The dryers work great. But how do I dry the dryers? I am Leary about putting them in a plastic bag for storage without drying out first. BEST ANSWER: I just leave the beads in the decanter and they have dried fine. Eventually after multiple uses the beads turn pink, then I put them in the microwave for about a minute and they turn blue again. After several years I buy new ones. You do not need to worry about drying them before putting them away. Just put them in the microwave before you use them again. Always put them in a sealed bag for storage and don't "burn" them when in the microwave. After using the dryer in the decanter, I lay it flat on a plate and let it air dry. Dries very quickly. After they are dry, I store them in a zip lock bag. Hope this is helpful. What are the 'beads' made of that are inside the Muslim sack? BEST ANSWER: The 'beads' inside the Wine Decanter Dryer (Set of 2) are made from silica crystals which are highly absorbent and will dry your decanter quickly and efficiently. The fabric is a knit - not cotton woven (muslin). Will this wine decanter dryer set work with (fit inside) my Riedel Black Tie Bliss decanter? Yes, even if it does not touch the very bottom of the decanter it will aid in the drying process. My drying sack dangles in my decanter and works fabulously. Does not hinder the process. BEST ANSWER: Yes. I tied the two pieces together and then tied a piece of string to one end and was able to get the dryer all the way around the Eve decanter. the wine decanter dryer will be able to dry a portion of this decanter but you will be unable to get it down and around all of the decanter. Does it ever stop drying? If so, how can it be fixed? BEST ANSWER: After use you do need to give it a little time before using it again. Other than that it does not stop. I have a Venini decanter with a very narrow neck. Would I be able to untie the cloth, remove some of the crystals from the dryer and then retie it if needed to allow it fit inside? BEST ANSWER: The Decanter Dryers would not be able to be untied from it original shape but you could probably cut it and then re-tie the sleeve to fit in your decanter. BEST ANSWER: Thank you for your question, after washing and draining out your decanter you would simply insert this dryer in to the decanter. The crystals contained within the muslin sleeve will absorb every last drop that remained. This is the best thing since sliced bread! I use it for decanters, vases and anything else that is hard to dry inside. I HAD TRIED EVERYTHING UNDER THE SUN TO GET THE SPOTTED DECANTERS DRY - THIS LITTLE THING IS WONDERFUL. I WASH THE DECANTER WITH HOT WATER, I USED THE CLEANING BEADS, THEN PUT IT ON THE DRYING STAND AND FINISH CLEANING UP. WHEN I AM DONE I TAKE THE DECANTER AND STAND IT UP AND PUT THE DECANTER DRYER IN IT. THE NEXT MORNING IT IS PERFECT AND READY TO BE USED AGAIN!!! Overall, ok. does what it says but sheds material inside sometimes. The cardboard that hold it up bends too much and I don't anticipate it lasting too long. It should be made of plastic. Incredible how fast dries up the decanter with no stains. I used this product to dry out a Waterford decanter with a narrow neck and wide base. It worked perfectly. Well worth the money! Thank you for a perfect product to eliminate condensation from our wine decanters. Can hardly believe it !! Washed our decanter (small neck, difficult to dry; sometimes took days), went out to dinner and by the time we got home (about 5hr later) the decanter was totally dry. We highly recommend this product. Will buy for family/friends as gifts. Great product. We have a thin-necked Decanter that took Forever to dry. This devise did in less than 5 hr what took DAYS to do without it !!. It really does completely dry the inside of the decanter, getting rid of all the moisture drops. Wasn't clear at first they would be long enough for may of my decanters, but haven't gotten them to work and they really do well on drying. Encourages a vigorous cleaning now that I can get humidity out of glass. A better collar were added. The thin cardboard doesn't hold up s I clipped the top of the tubes with wooden, disposable type cocktail forked picks (avoiding piercing the sock). This works great and IMO looks better. I set aside one of the collars so i know that source of the dryers. My only concern is when the crystals turn pink. I put the dryers in a 1,000 watt microwave for a minute but only a few streaks of blue crystals appeared again and the cloth tubes got pretty warm. Does anyone have a better option for when the tubes stop working? The concept is great but unfortunately we were finding tiny silicone beads everywhere including inside the wine decanter. Maybe the netting needs to be a little tighter weave to hold them in. It doesn't work. It clearly absorbed some of the wine, but my decanter is still dirty after using it.